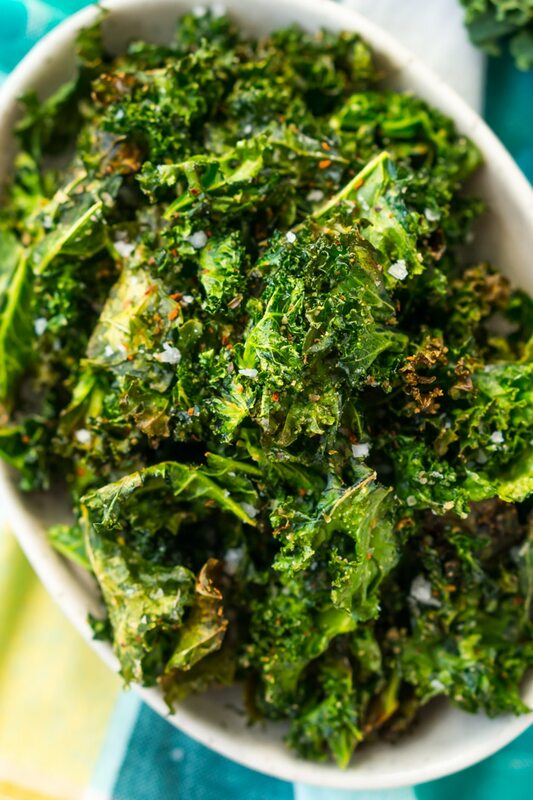 Kale Chips are easy, healthy, and addictive! You’ll love this simple, crunchy snack that’s loaded with delicious flavor and nutrients! Only 50 calories and 1 Weight Watchers Smart Point per serving! I absolutely love Kale Chips! They’re a bit of a weird concept when you first hear about them, but once you first taste them, you’ll be addicted too! And if you’re starting the new year off by eating right, you’re going to love this tasty little snack recipe! I started making kale chips about 5 years ago when I was on a sugar, dairy, and gluten detox. This recipe was a lifesaver when I was craving things that were salty! Yes, kale doesn’t lose nutrients when baked. There is a small amount of oil on them and the rest is seasonings. This recipe has 50 calories and 1 Weight Watchers Smart Point per serving. Kale is an excellent source of vitamin K, vitamin C, and vitamin A. It’s also a very good source of vitamin B6, fiber, calcium, potassium, vitamin E, and vitamin B2. I love the flavors of these kale chips, the primary seasoning is garlic and onion powder, but also oregano, chili pepper, and salt. 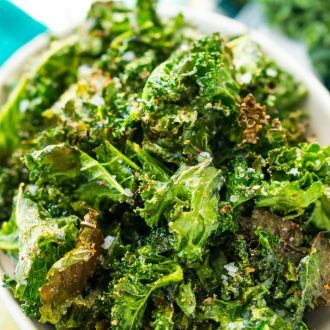 You just mix the seasonings with fresh kale, and olive oil, until evenly coated and bake for a short time until crispy. The end result is a light and delicious snack recipe you don’t have to feel guilty about! Salad Spinner – It’s important to make sure that the kale is dry before mixing with the other ingredients and baking it. A salad spinner is the easiest way to do this, plus, these things will change your life if you make salads a lot! Baking Sheet – It’s best to use a large baking sheet with a lip, you want to be able to spread the kale out on the pan so it isn’t too bunched together. Parchment Paper – You’ll want to line your baking sheet with parchment paper so that your kale doesn’t stick to the pan. 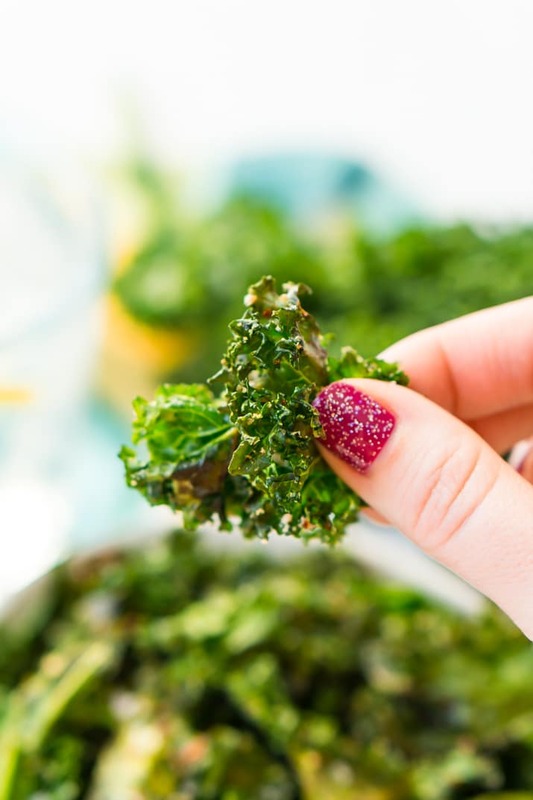 Kale Chips are easy, healthy, and addictive! You'll love this simple, crunchy snack that's loaded with delicious flavor and nutrients! Only 50 calories and 1 Weight Watchers Smart Point per serving! Wash kale and use a knife to separate the leaves from the stems, chop the leaves into large, but bite-sized pieces. Add the leaves to a salad spinner and spin until dry. Add leaves to a large bowl, add the oil and mix to combine. Oil should coat all of the leaves after 30 seconds of mixing or so. If it seems a little dry, add a few more drops of oil. Add the salt and seasonings and stir well to combine. Spread the kale out on the baking pan in a single layer, depending on the number of chips you have, you may need to bake in two batches. Bake for 10 minutes, remove from oven and use a spatula to flip the kale over and bake for another 10 minutes. Let the chips cool for a few minutes on the pan and then eat immediately. Cayenne pepper can be used in place of Aleppo pepper. Coconut oil can be used in place of olive oil, make sure to melt it first. 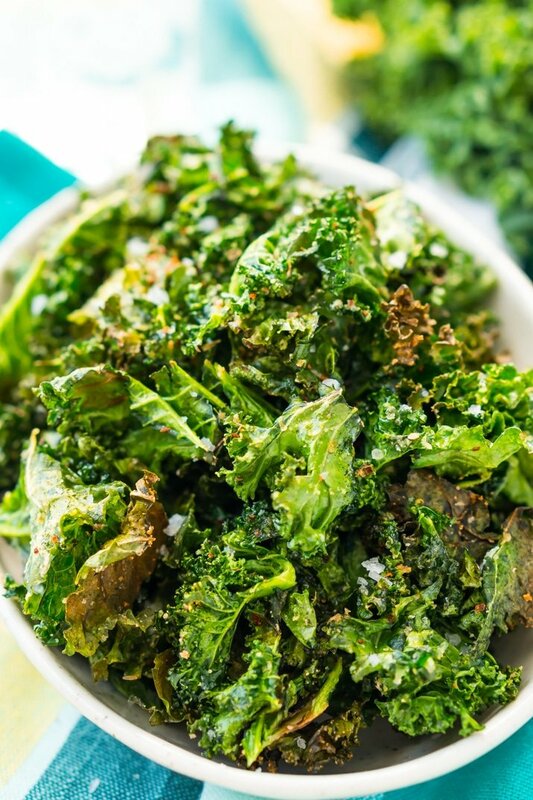 Pin this Kale Chips Recipe for Later! This post was originally published May 2013 and was updated January 2018. 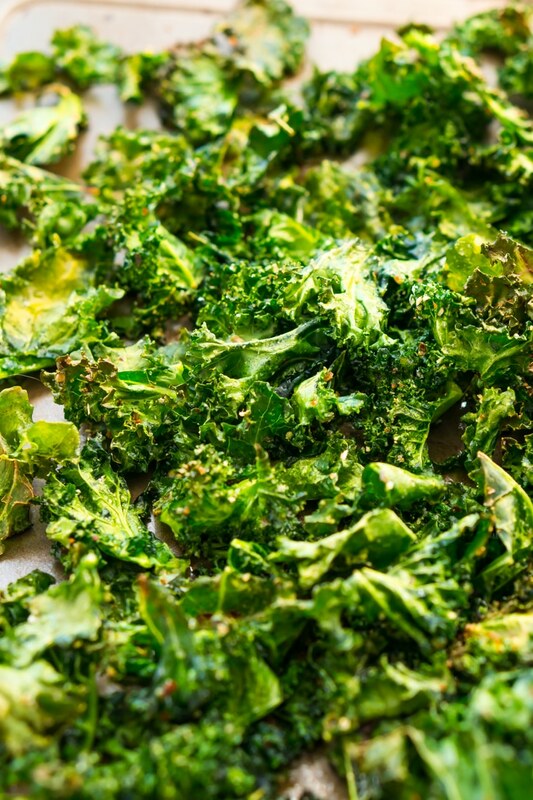 Oh my goodness…never knew Kale chips were this simple to create! How fun! They look delicious, Rebecca! Thanks Kristi! They are super simple, and I hope you get the chance to try them. Kale chips are such a delicious, healthy and easy snack. Love them! p.s. how fun is your nail polish! I still haven’t tried kale chips, but I think it might be time! Yours look amazing and your instructions seem easy enough! Kale chips are such a great snack! Who knew they were so simple to make? Delicous!! Super simple to make and looks amazing for a healthy snack! Such a great idea!